Tickets for Storm’s upcoming game against Fife Flyers can be ordered online HERE, or by calling the box office on 0161 926 8782, or in person at the box office. 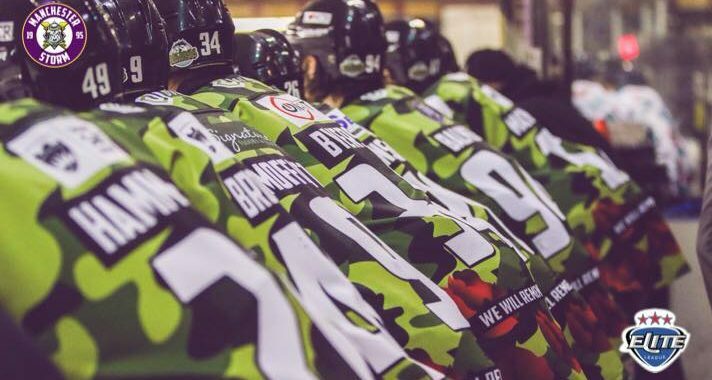 Last night saw the Storm players showcase special jerseys, as the club hosted Armed Forces night, collaborating with the Royal British Legion and starting the poppy appeal off as part of the ThankYou 100 campaign. Prior to the first face-off, a ceremony was held, wreaths were laid by both captains, mascots and members of the Manchester Storm Academy. A memorial video was played – followed by The Last Post and a minutes silence held for those lost in war. 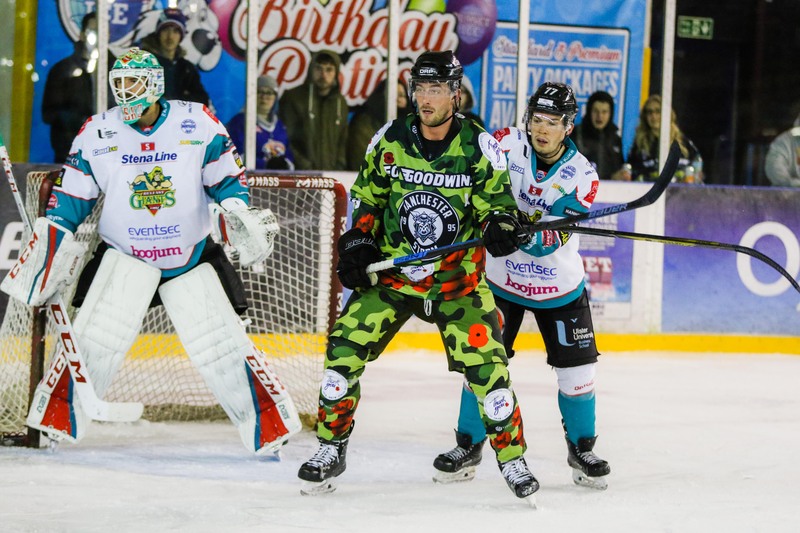 The game was the first meeting between Manchester Storm and Belfast Giants this season, and it was exciting from start to end, as both teams played their hardest to secure the win. 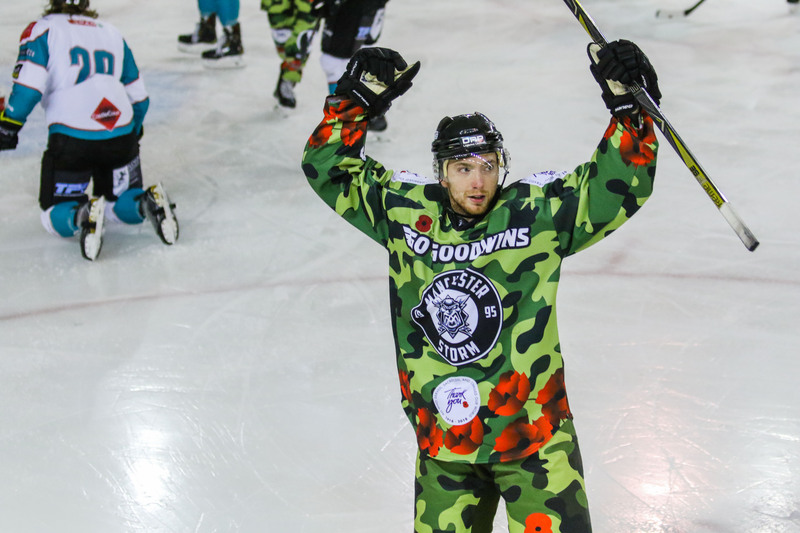 It was also the debut from newly signed Storm player and gold medal winner, Brendan Brooks. Much to everyone’s delight, defenceman, Félix-Antoine Poulin was back on the ice for warm ups AND the game, after spending recent weeks in a cast following an injury. It was a chaotic first period last night and it had it all: plenty of penalties, a few fights and three goals. It was Storm who scored the first goal of the evening, just over one minute into play – Moffat tapping the puck in with the assist from Macmillan, 1:04. Johner, of Giants was the first to sit in the box for two minutes, for slashing at 1:48. 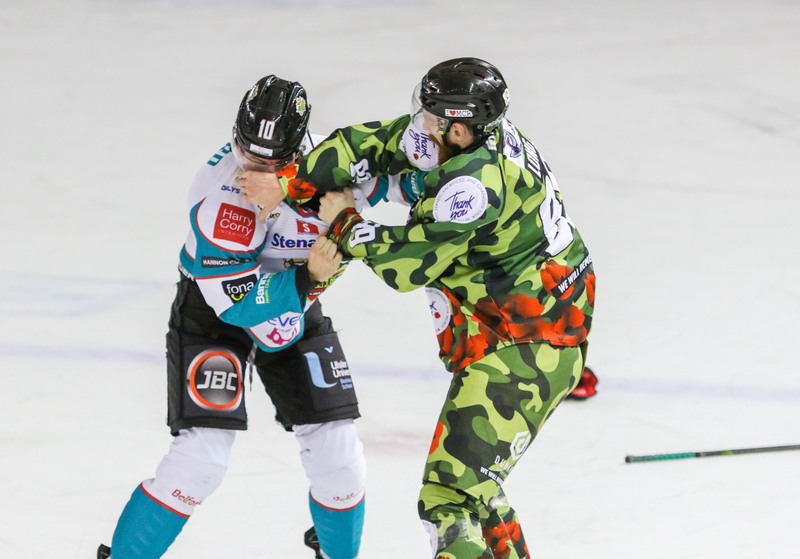 Things became scrappy around Storm’s end, resulting in Byers receiving a two plus ten minute penalty for boarding and two for roughing, at 3:2; Giants player, Ferland also sat two minutes for roughing. Auger took his chances on a short-handed breakaway, only to be denied by Beskorowany. Giants managed to get their first goal of the night, as Riley put one past Ginn, assisted by Murphy and Rutherford at 10:56. Just five minutes later at 15:06, the same line scored again, going one up against Storm, scored by Murphy, assisted by Rutherford and Riley. It was Ciaran Long and Leonard who came to blows in the final two minutes of play. This resulted in Long receiving five minutes for fighting, and an extra five minutes plus game ban for interference. Leonard also took five minutes for fighting and a ten plus two for instigating. Ferland, who was injured during play was helped up off the ice and play continued. Things kicked off again in the final minute of play at 19:41 when Stadel was boarded and Ehrhardt stepped in against Giants forward, Riley – both throwing tilts, before being sent to the penalty box. Both received five minutes for fighting, Ehrhardt a further two plus ten for instigating and Riley with two plus ten for boarding. Despite so many stoppages in play, it was a fast paced first period, exciting to see. The second period was slightly more calm and slightly less eventful regarding fights. Giants scored two minutes in at 22:44, put in by Baun, assisted by Johner and Murphy. This goal was reviewed, but given, giving Giants the two goal lead. It wasn’t long before Storm claimed their second goal of the evening at 26:35, when Hammond put the puck in on a one timer, on a pass across from Linsmayer and second assist from Bakker. Poulin received a penalty for slashing at 27:10, and it wasn’t long before former Storm player and current Giants defenceman Paul Swindlehurst, also took a penalty for interference just a few minutes later, giving Storm a chance to break even on the powerplay, taking every chance they could. Just as the buzzer went finalising the second period, another fight broke loose between Bakker and Mcfaull. Both took a five minute penalty for fighting, with Bakker being given an extra two for charging, and Mcfaull a two plus ten for instigating. The third period was a constant battle for Storm to get the equaliser, and Giants to get another goal, as both teams put on an exceptional performance. At 14:02, Murphy received a penalty for hooking, also taking the opportunity on a short-handed breakaway, to be denied by Ginn. It was the kick Storm needed to get back into action on their powerplay but Belfast’s defence played solid, not letting anything through. Giants took another penalty in the final ten minutes of play at 51:17, challenging the Giants on another strong powerplay. In an exciting third period, Storm managed to break even at 56:26, tapped in by Auger and assisted by Stadel and Richardson. The final few minutes were tense, giving spectators end to end hockey, and the final buzzer signalling the end of regular time, both teams going into three on three overtime, tied at 3-3.
in the final minute of play, at 64:20, Giants took the puck home, when Rutherford secured the win at 4-3. Storm may not have clinched their 6th home win in a row, but still took a point. It was an all round physical and highly competitive game, both teams providing one of the most exciting hockey games of the season so far.